In the late ’90s, when I was a manager at the Michigan Humane Society, a woman named Betsy Saul was trying to sell me on the idea of posting adoptable animals on the Web site www.petfinder.com to help them get adopted. I thought she was nuts. The Michigan Humane Society took in 50,000 animals a year, adopted out 13,000 and she wanted me to take pictures of all of them? At the time, our shelters didn’t have computers that were connected to the Internet and we used Polaroid cameras (if you’re under 20, you might have to Google this) to take pictures of a few of the animals to be posted around town in an effort to gain visibility. And that was a chore. I wondered how we would ever pull this “posting on the internet” thing off. Aside from the extra workload, I envisioned getting calls from people who lived in Ohio, Illinois, and other nearby states asking us to ship them the animal they saw pictured on the internet. I didn’t quite get the concept. Luckily, our team of managers decided to give it a go and recruited volunteers to take up the task of photographing adoptable pets and posting them online. It’s a good thing we did. Now, 15 years later, Petfinder has helped more than 17 million pets find homes and has become the world’s No. 1 pet site. In addition, in 2003 the Petfinder Foundation was created, and more than $10 million has been donated to shelters and rescue groups. Petfinder has also launched an iPhone app that was named one of TIME’s top 10 iPhone apps of 2010. The Petfinder idea all started on New Year’s Eve in 1995 when Betsy and Jared Saul started discussing who could benefit from the World Wide Web. Since they both loved animals, they thought a Web site should exist to connect shelter pets with adopters. It’s a good thing it was New Year’s Resolution time, because Betsy and Jared made it their resolution to build the Web site. At the time, they thought they could save the life of at least one homeless pet per month. In the early days of the site, shelters and rescue groups would fax information about their adoptable pets to Betsy and Jared and they would manually add them to the site. As the Petfinder site grew, animal shelters and rescue groups started adding their own pictures of adoptable pets. One of the greatest aspects about Petfinder is the fact that due to corporate sponsorships, even 15 years later, the site still remains free for adoption groups as well as visitors. To check out Petfinder’s Web site, visit www.petfinder.org. On behalf of the 17 million pets that now have homes, and for the homeless pets that will be helped in the future. Thank you Betsy and Jared Saul! And happy birthday Petfinder! RESQCATS is a nonprofit cat sanctuary located in Santa Barbara, California, and is dedicated to the rescue, care, and adoption of abandoned cats and kittens. All the cats and kittens at RESQCATS have had a full veterinary exam and have been vaccinated, wormed, spayed or neutered and tested for leukemia and microchipped. To view the adoptable pet list from RESQCATS, visit: http://www.petfinder.com/shelters/CA1243.html. If you aren’t able to adopt, but still want to help, you can always send a donation to help the kitties. Please send donations to: RESQCATS, c/o Jeffyne Telson, PO Box 3852, Santa Barbara, CA 93130. You can also help by supplying something from the RESQCATS wish list. RESQCATS is looking for: cat beds, kitty condos, scratching posts, cat toys, scoopable litter, regular cat litter, cat carriers, and Wellness brand canned kitten food. You can also open your home to a litter of kittens who are in need of foster homes. For more information about RESQCATS, visit www.resqcats.org or call (805) 563-9424 for an adoption appointment. DAWG (Dog Adoption and Welfare Group) is a no-kill not for profit dog rescue/adoption organization located at 5480 Overpass Road in Goleta. For the adoptable pet list from DAWG, visit: http://www.petfinder.com/shelters/CA719.html. The public is invited to stop by and look around every day from 9 a.m. to 4 p.m.. DAWG relies on volunteers to take care of all the dogs, so if you love dogs, think about volunteering! Students are able to fulfill their volunteer community service requirement by volunteering. Volunteer orientations are generally held every other Saturday at 10 a.m. Contact DAWG for the next meeting. For more information, call (805) 681-0561. Penny is a sweet, adorable two-year-old, 40-pound pointer mix who emulates an “All American Dog.” Penny gets along with all dogs, does well at off-site events with crowds, confusion, noise, and she is even assessed as good with grade-school kids and maybe your cat. Penny likes playing with balls, ropes, people, or even by herself. She seems eager to learn and was extremely attentive (treat-motivated) to her handler at recent training sessions. Penny is searching for his forever home while waiting at the Santa Barbara County Animal Shelter. K- 9 PALS is the volunteer, nonprofit organization that promotes adoptions, provides humane care, and acts as advocate for the dogs at the shelter to eliminate euthanasia so that every adoptable dog will have a chance for a loving forever home. See more photos and learn how you can adopt Penny at www.K-9PALS.org. Dog-viewing hours are Mon.-Fri., 9 a.m.-4:45 p.m.; Sat., 10 a.m.-4 p.m. All K-9 PALS dogs are spayed/neutered and have current vaccinations. All adoptions come with FREE group dog-training sessions at the shelter. Do you love dogs, but can’t have a pet? 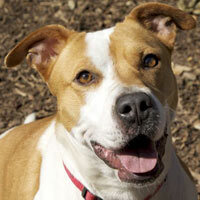 Volunteer with K-9 PALS or make a donation to sponsor a dog while it waits for its forever home. Volunteer orientations are held twice a month on Saturdays. For details about volunteering and orientation schedule, visit www.K-9PALS.org or call 681-4369.